An illegal immigrant who knocked down and killed a Wolverhampton schoolboy after a drinking spree may never be kicked out of Britain, despite being told he would be deported, it was revealed today. There is still no sign of Aaron Chisango being given the boot two and a half years after he mowed down 12-year-old pedestrian Jamie Mason. The trained nurse, who should have been deported in October 2004, is hiding behind a court ruling banning the forced deportation of anybody back to Zimbabwe because of the dangers they might face there. The Government is battling to overturn the controversial judgement but the legal struggle has already lasted for months and shows no sign of ending soon. Chisango, aged 28, was travelling on a passport from that country when he came to the UK and is understood to have joined the Zimbabwe opposition party after the death smash in a bid to add weight to the argument that he would be at risk if ordered back to the trouble-torn African nation. 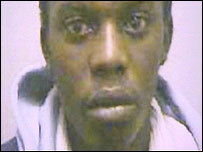 The saga has heaped extra misery on the family of Jamie who was killed crossing a Wolverhampton road in January 2005. Zambian-born Chisango came to the UK on a student visa to study as a nurse but overstayed the time limit and should have been sent home in October 2004 - three months before Jamie died. Jamie’s mother Hayley was today too upset to comment.